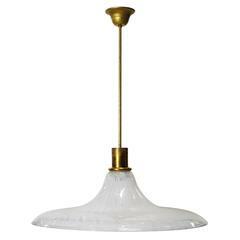 Abaco Suspension lamp, designed by Monica Guggisberg and Philip Baldwin and manufactured by Venini, is available with 5 lights (823.00). "One the one hand, the sphere: the most ubiquitous form in the known universe. On the other, mathematical calculation: counting, numbers, man’s endless attempt to rationalize an otherwise intuitive world. But never mind this the spheres exude light, the source of intelligence, heated expression, and beauty", say the designers. Available in two combinations of colors each. Indoor use only. Dimensions: Ø 19 cm, H 589 cm. 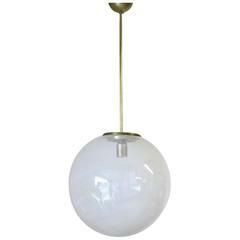 Italian Murano swirl glass globe pendant by Venini. 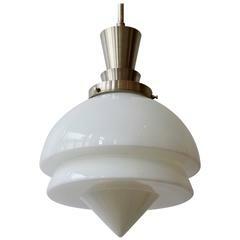 Single light socket ; wired for the U.S.
Opaline glass pendant light by Gispen, Holland. Single standard light socket, wired for the US.